Crews dismantled the wreckage Tuesday from a subway train collision that killed nine people and injured scores of others in the nation's capital, and a federal investigator revealed an old train involved in the crash should have been replaced because of safety concerns. The Metrorail transit system kept the old trains running despite warnings in 2006, said Debbie Hersman of the National Transportation Safety Board. It wasn't immediately clear what caused the crash and whether age played a role in the rush-hour collision Monday. The crash sent more than 70 people to hospitals. Metro officials said two men and seven women, all adults, were killed. Mayor Adrian Fenty said at an earlier news conference that seven people were killed and he hoped the death toll did not climb any higher. Hersman said investigators expect to recover recorders from a newer train that was stopped along the tracks waiting for another to clear the station ahead. But the old train that barreled down the tracks and triggered the collision was part of aging fleet and not equipped with the devices, which can provide valuable information on the cause of a crash. CBS News correspondent Nancy Cordes reports that the NTSB said Tuesday evening that the moving train had been running in automatic mode, which is similar to autopilot on an airplane. The emergency brake button was pushed in, suggesting the operator did try and stop the train. Hersman told The Associated Press that the NTSB had warned of safety problems and recommended the old fleet be phased out or retrofitted to make it better withstand a crash. Neither was done, she said, which the NTSB considered "unacceptable." Metro officials planned to replace the old trains, but were years away from actually having them on the tracks. It was the worst crash in the history of Metrorail, the pride of the District of Colombia tourism industry that has shuttled tourists and commuters around Washington and to Maryland and Virginia suburbs for more than three decades. The operator of the train that collided into the stopped cars was identified as Jeanice McMillan, 42, of Springfield, Va., according to Metro officials. McMillan was hired in March 2007 as a bus driver and was tapped to become a train operator in December, but it wasn't immediately clear whether she had control of the cars. Metro has a computerized system on most trains during rush hour that is supposed to control braking, speeds and prevent collisions. The system, however, has failed before. In June 2005, in a tunnel under the Potomac River, a train operator noticed he was getting too close to the train ahead of him even though the system indicated the track was clear. He hit the emergency brake in time, as did the operator of another train behind him. Metro spokeswoman Candace Smith didn't know the outcome of the investigation into that incident, which she called "highly unusual." The crash Monday occurred on the red line near the D.C. and Maryland border, in an area where higher train speeds are common because there is a longer distance between stops. Trains can go 55 to 59 miles per hour, though the train's speed at the time of the accident hasn't yet been determined. One of McMillan's neighbors said she was proud of her job and was a meticulous mother who ironed her Metro uniform every night. "If she could have stopped the train, she would have done everything in her power," said Joanne Harrison, who lives across the hall from McMillan. Passenger Maya Maroto, 31, was riding on McMillan's train. "We were going full speed - I didn't hear any braking. Everything was just going normally. Then there was a very loud impact. We all fell out of our seats. Then the train filled up with smoke. I was coughing," Maroto said. Maroto, of Burtonsville, Md., said there was confusion after the impact because no announcements were immediately made. She said some passengers wanted to climb out, but others were afraid of being electrocuted by a rail. 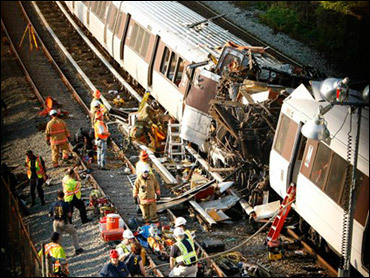 In January 2007, a subway train derailed in downtown Washington, sending 20 people to the hospital and prompting the rescue of 60 others from the tunnel. In November 2006, two Metro track workers were struck and killed by an out-of-service train. An investigation found that the train operator failed to follow safety procedures. Another Metro worker was struck and killed in May 2006.